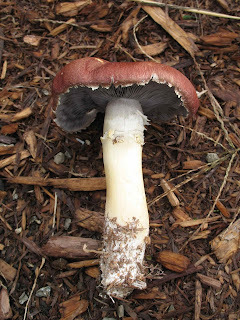 Defining Characteristics: Wine colored cap (possibly fading as it ages), pronounced ring on white stalk, lilac to purple gills. Often growing on wood chips, especially when you planted the spawn yourself! Dark purplish spore print. 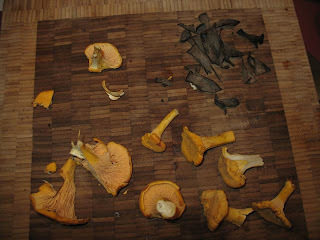 This spring I decided that I wasn't finding enough mushrooms I felt comfortable eating in the wild, and ought to supplement my finds with yummy home grown fungi. I have had moderate success with growing oyster mushrooms on coffee grounds (I am planning a big project this coming winter with oysters- stay tuned!) and thought it was time to try out some outdoor kits. 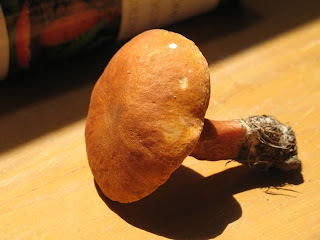 The Wine Cap Stropharia is supposed to be one of the easiest to grow and has the added benefit of simultaneously providing you with an additional crop from the same amount of garden, and increasing the mycelial density in your garden, which is generally regarded to help out the size and health of your veggies! As you can see from the picture above, the Wine Cap grows very well on wood chips. I laid down a thin layer of wood chips over about a 20 square foot area in the herb garden, then spread out the kit I bought from Field and Forest Products over the wood chips, and then covered it all with another inch or so of wood chips. After that all you need to do is regularly water the chips ( ~1 inch of water per week) and think happy thoughts! I planted the kit in June of this year- the kit suggested that I might get a crop before winter depending on rain, early frosts, etc... and then I should get a full crop this coming May or June. After the spring fruiting you can add more wood chips to renew the bed, or take a shovel-full of the inoculated wood chips and add them to a new pile! Hopefully I will be able to keep the Wine Caps thriving and spreading through my garden for years to come. 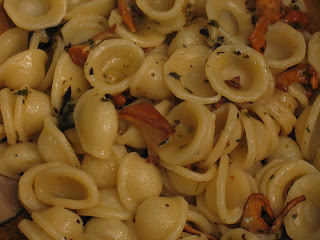 Now down to the important details: the mushroom. I planted the kit up in Maine, probably a few weeks later than ideal (given the short Maine growing season) and as a result I only got this one mushroom from the kit- but at least I got something, and I know the mycelium is alive and growing! 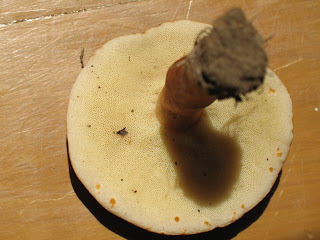 It was about 3 inches across the cap, with a 4 inch stem and firm flesh. 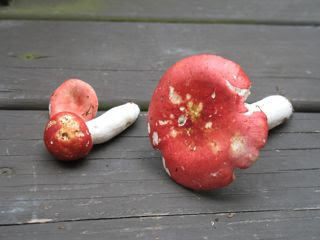 Quite a satisfying mushroom to grow, and after I had checked my mushroom books and made sure that I had what I thought I had (always a good idea with mushrooms!) I cooked it right up. Online recipes suggest that the Wine Cape takes well to lemon and wine, as opposed to the traditional garlic, leek and similar preparation. Since it was my first time eating it I sauteed the mushroom in butter to better understand the taste of it plain (besides, sauteing food in butter is pretty fool-proof). It was excellent! It has a soft nutty flavor with a round juiciness. Somewhat hard to pin down on a flavor wheel, but very enjoyable. Hopefully next year I will have many more to write about and feast on- in the meantime you can read more about the Wine Cap Stropharia at MushroomExpert.com.